Why is my canned fruit floating? - Canning Homemade! Home » floating fruit » hot pack » raw pack » Why is my canned fruit floating? 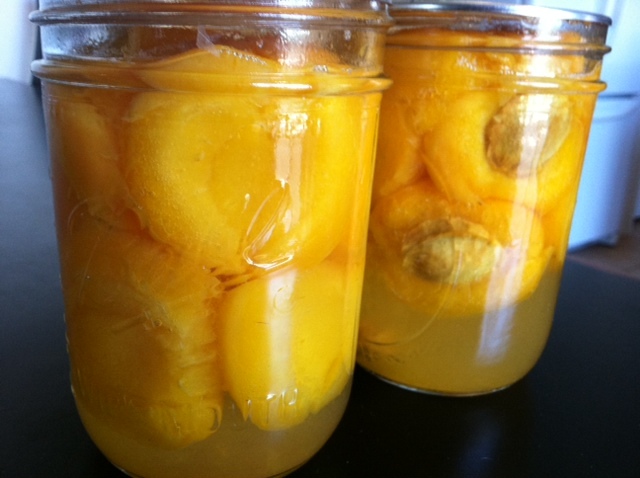 I recently posted a picture of my apricots floating in my jars. Here is why this happens! Loosely packed jars and improperly exhausted jars cause fruit to float. When putting the fruit in the jar, pack it snugly tight and then add your liquid. After filling the jars to the correct headspace, exhaust any trapped air bubbles by running a plastic chopstick or spatula around the inside of the jar. This dislodges any air under pieces of fruit. You may notice after exhausting that the fruit settles. You may need to add more fruit and/or liquid to maintain proper headspace and tightness of pack. If you do add more product or liquid, exhaust again before putting on the two-piece lid. Also using a regular mouth jar versus a wide mouth will help at the shoulder of the jar to keep all the fruit from floating. All fruit contains air in the cells. Raw-packing is the practice of filling jars tightly with freshly prepared, but unheated food. It appears to fill the jar. During processing, the air in the fruit is cooked out. The fruit shrinks in size creating more room in the jar, allowing the fruit to rise to the top. Sometimes the fruit rises above the syrup causing discoloration, usually within 2 to 3 months of storage. Hot packed fruit is heated prior to being packed in jars, simmering it 2 to 5minutes, and promptly filling jars loosely with the boiled food. The fruit will have less air and will be more dense, lessening the amount of float and improves shelf life. An additional benefit is more fruit can be packed in the jar and processing time is usually reduced. Be exact according to your recipe. Overcooking the fruit makes the fruit lighter by destroying the cell structure. This also gives the finished product a ragged appearance. In addition to the unappealing appearance, floating can contribute to food spoilage. When the fruit rises above the syrup, discoloration and drying out can occur. In extreme cases the fruit can rise up and touch the lid and even dislodge the lid. Check seals before serving. Store all jars with the rings off once a seal has occurred. If spoilage has occurred dispose of the product correctly. When in Doubt, throw it out! At first, the color of hot-packed foods may appear no better than that of raw-packed foods, but within a short storage period, both color and flavor of hot packed foods will be superior. I would like to thank the Washington State- WSU Cooperative Extension Whatcom County and the USDA Complete Guide to Home Canning for the information in this article!